It isn’t every day we hear about a pure oxygen workout. It makes us wonder what it’s all about – just about enough to tear ourselves away from bed on a Saturday morning – just this one time. So as it turns out, Nittro Bespoke Fitness gym (yes, that is a double 't') in Breach Candy pumps extra oxygen out from their air conditioning which is supposed to help us be less tired while working out, and thus help maintain stamina. We went into the basement, mildly anxious about whether our body would be able to handle all these surprises we were throwing at it – this extra dose of oxygen and a workout all in one day, but we took a chance. The first thought that goes went through our head is that if Juicy Couture was a person, she would be running in this gym. After collecting towels from the locker room (again with number-code lockers), it was time to begin the process. The personal trainer had a chat with us and got us started on the treadmill. Huffing and panting we nearly escaped that when we saw all around us gleaming red machines, all inviting us to try them, pick them, choose them. And so we did. From lifting up, to shaking to down, turning to the left, and touching the ground, we did our fair share of exercise for over an hour, all this while not sweating a bead – the oxygen-ac to be thanked/blamed perhaps? Then we stretched out in their lower basement workout space, where they also hold Zumba, pilates, Bollywood dancing and yoga sessions over the week, ready to spend the rest of the day not wincing at every step. Are we heading back? Not for any extra air, for sure – but if you’re looking for a rather glitzy gym to give the illusion of a party (it’s a lie, the muscles still hurt), you know where to visit. As for us, this time, curiosity killed the fat. 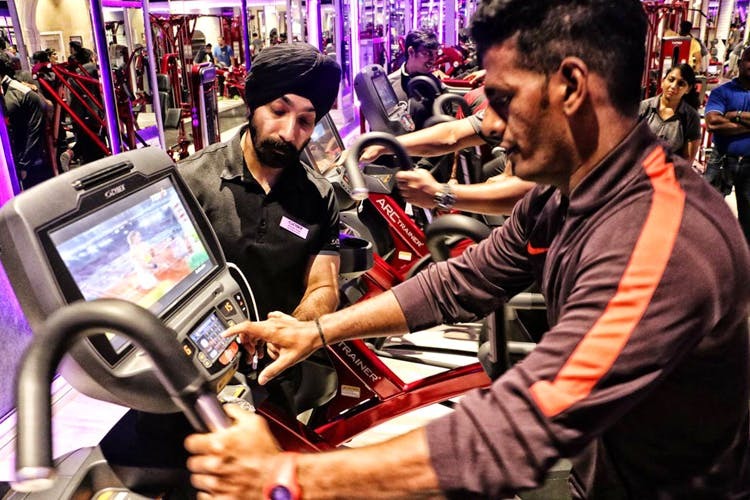 Price: INR 3,000 for a trial, INR 17,700 for a monthly membership, and INR 59,000 for an annual membership.